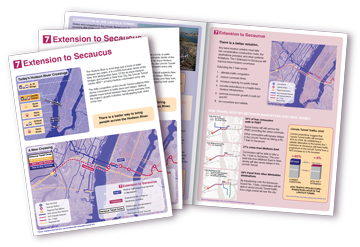 RethinkNYC is a comprehensive proposal for building a world class transportation network in the New York City region. The first step of the proposal establishes the Regional Unified Network (RUN). When fully built, RUN will allow you to get from anywhere in the region to everywhere else via mass transit with seamless and easy connections. In 2019, New York City’s Metropolitan Transportation Authority will start an 18‐month‐long project to rehabilitate the L Train’s Canarsie Tunnel. To reach Manhattan during the tunnel closure, the L Train passengers will have to rely on a multi‐seat subway ride and less efficient modes of transit. ReThink Studio proposes a reconfiguration of E Train service, taking advantage of underutilized infrastructure and requiring minimal new construction.